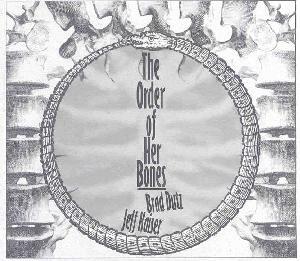 Jeff Kaiser - "17 Themes For Ockodektet" / Jeff Kaiser & Brad Dutz - "The Order Of Her Bones"
Based in Ventura, California, Jeff Kaiser is an active composer, trumpet player, conductor, and music teacher. He has played with countless musicians in the creative music realm, including Eugene Chadbourne and The Motor Totemist Guild. He has worked in radio and television and is active in promoting modern music concerts in Ventura, CA. The ambitious 17 Themes For Ockodektet is one of two recent releases on Kaisers pfMENTUM label. The Ockodektet is a large ensemble consisting of Eric Barber, Vinny Golia, Emily Hay and Lynn Johnston on woodwinds, Don Clucas and Kris Tiner on trumpets, Eric Sbar on euphonium and valve-trombone, Mark Weaver on tuba, Ernesto Diaz-Infante on prepared acoustic guitar, G.E. Stinson on electric guitar and electronics, Wayne Peet on organ, theremin and electronics, Jim Connolly and Scott Walton on contrabasses, Billy Mintz on drums, Brad Dutz on percussion, and Jeff Kaiser on trumpet and conducting. Recorded live at Ventura, CA City Hall on Kaiser's 40th birthday in late 2001, this sizable ensemble incorporates both classical and jazz influences. The music comfortably inhabits both the classical and jazz worlds, at times sounding like a horn/wind driven symphony, but also having a cosmic cool jazz sound with those beautiful low end contrabass notes keeping a slow but steady pace. Jazz and classical often come together as the ensemble heads into highly intense thematic orchestral territory with jazz still rearing it's much welcome head throughout. The spirit of the Sun Ra Arkestra fills the air, though the orchestral elements keep the music firmly on it's own personal Ockodektet plane. Imagine the Arkestra performing their rendition of Peter and the Wolf and you might get something like the Ockodektet. The ensemble continually transitions between slower and fiery chaotic segments, the slower moments being highly passionate in which each instrument is distinct amongst the whole... each blow on a horn or wind instrument standing on the podium to make its statement, and haunting electronic swirls can sometimes be heard as a dark backdrop. Overall, a thoroughly captivating 73 minutes of modern music for large ensemble. 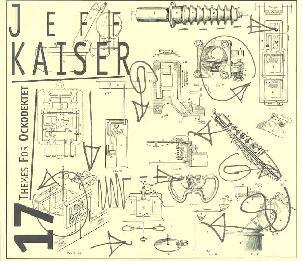 The Order Of Her Bones is a duo project of Kaiser on trumpet, flugelhorn and voices, and Brad Dutz on marimba, xylophone, drums, and more bells, percussion and assorted toys than I could begin to list. (or even identify... do you know what a bougarabou or a tuba flute is?) Anyway, Kaiser and Dutz manage to keep things remarkably busy for only two musicians. Even the most subtle moments spoke to me in a loud voice. The horn is garrulous and the percussion melodic. Jazz dominates throughout but there are ambient/atmospheric moments and the whole thing comes off like a story is being told. Kaiser is a proficient but communicative horn player. He can tear up his instrument but at all times I feel like he's speaking to me and not just showing his chops. Dutz's performance is responsible for much of the atmosphere and theme, smoothly moving between his arsenal of percussive tools. But the real strength of the album is that it sounds like an animated conversation between the two artists. Quite different from the Ockodektet but equally expressive. For more information you can visit the pfMENTUM web site at: http://www.pfmentum.com. Contact via snail mail c/o pfMENTUM; PO Box 1653; Ventura, CA 93002. Jeff Kaiser is also the founder and co-editor of NewCreativeMusic.com, an excellent web zine with lots of insightful articles.